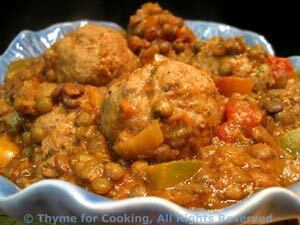 Lentil and Meatball Stew, Thyme for Cooking easy one dish dinners. Pick over lentils in case they missed the odd stone. Rinse. Put green or brown lentils and beef stock in a saucepan. Bring to a boil, then cover and simmer until lentils are done. They should absorb most of the stock. Don't let them dry out. Drain any remaining stock when done. Chop onion, pepper, celery. Mince garlic. Heat oil in large skillet over medium heat. Add paprika and sauté 10 seconds. Add onion, pepper and celery, sauté briefly. Add garlic, sauté a few minutes longer. Open and chop tomatoes, reserving all juices. Add tomatoes, red lentils, all reserved juices, herbs and wine to skillet. Bring to a boil. Add meatballs. Reduce heat and simmer, partially covered, until meatballs are done, turning meatballs and stirring sauce periodically, 20 - 25 minutes. In medium bowl lightly whisk egg. Add breadcrumbs, mustard, ketchup, wine and herbs, mix well. Add drained lentils to meatballs in skillet. Stir well to combine and serve.